Third Challenge of 2010 - Still A Good One! "Isn't growing up a puzzle? Isn't somehow growing old with a mind that still feels young an even bigger one?" It started out as a puzzling dare. First, Vanessa sent me this lovely layout using puzzle pieces so effectively, I then thought perhaps you would like to try making a page with puzzle pieces on it somewhere as a challenge. Thank you, Vanessa. I am really pleased to have a piece of your lovely work to inspire people. There's a place for you to show your challenge entry at the bottom of the page. Scroll down to see. Notice how Vanessa has used the puzzle pieces to give the photo itself an interesting tweak? I think this technique really conveys a mood and adds movement to her page. She has used more puzzle pieces for her title. I really like the effect of this against her white space. Even though the people in the photo are female, there is not a flower in sight on the page. The puzzle pieces are enough embellishment here, don't you think? My eyes are really drawn to the figures in the photo because of the way Vanessa has used her puzzle pieces. 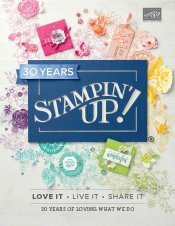 You do not need a puzzle punch to make your layout but you can get some lovely dies from Stampin' Up! if you want to make a puzzle. They are called the Puzzle Pieces Thinlits Dies. Remember you can always draw your pieces freehand on the reverse side of your photo or cardstock before cutting them out, but a set of dies might make the cut outs more to your liking, unless you are good at fussy cutting. I am not so I am going to get good use out of the dies! Another good thing about dies is that you can cut out heavier materials more easily, such as craft weight cardstock, chipboard or light cork or even thin metal. 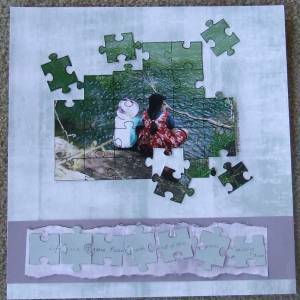 You might want to make a mixed media piece with this challenge, so would perhaps choose other materials than cardstock to make your puzzle pieces. There are other advantages to drawing your own design, though. When you freehand it, you can decide how large or small to make your pieces. And you can take in certain parts of the photo by drawing a template around features you want to cut out. Tip: Try making a puzzle template with vellum so you can see where the piece's lines will fall before you cut them out. Oh and by the way, you do not have to make a layout this time if you would rather make a card or a 3-d papercraft project or an ATC or two or three. As long as your project has a puzzle piece on it, you will have fulfilled the challenge. So go ahead and start crafting! NOTE: Even though the deadline is over now, I hope you are inspired to join in on the third challenge of 2010. Puzzles are always popular with me. I'm looking forward to seeing what you will make no matter when you take on this project idea.